Director Dean DeBlois of HOW TO TRAIN YOUR DRAGON: THE HIDDEN WORLD. ©DreamWorks Animations LLC. HOLLYWOOD—The third and final installment of DreamWorks’ popular animated franchise, “How to Train Your Dragon,” flies into theaters Friday Feb. 22. Audiences can expect to be awed by spectacular cutting-edge computer animation along with a heartfelt story of friendship, loyalty and letting go. 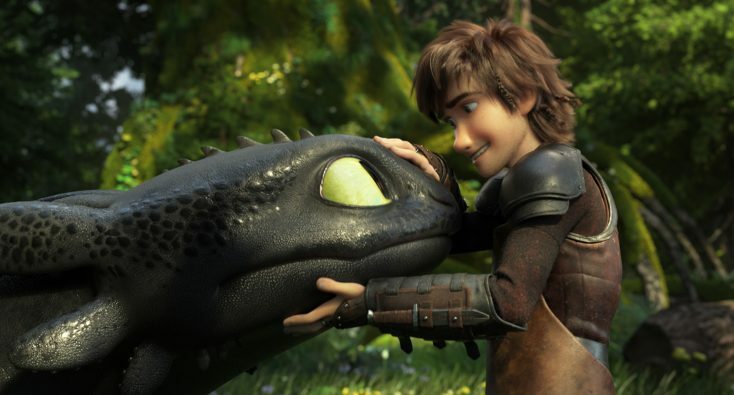 Based on the beloved book series by Cressida Cowell, the film franchise began with the 2010 release of “How to Train Your Dragon,” spawning a sequel four years later and now, a final chapter that brings the story full circle. “How to Train Your Dragon: The Hidden World” takes audiences on a final ride with its central characters Hiccup, Astrid and Hiccup’s dragon Toothless. Humans are living in harmony with dragons in their small coastal kingdom. Yet, it is getting crowded and rowdy with the influx of so many dragons that have been rescued by the newly crowned Hiccup, who ascended to the throne at the end of the last film. With a new foe, who wants to eradicated all dragons, especially the Fury variety like Toothless, Hiccup realizes he has to gear up for the most important battle of his life. With the support of his friend Astrid, he decides to move the dragons to a place where they will forever be safe, a mythical hidden world that his later father Stoick told him about when he was younger. That place is far away in the middle of the ocean and dangerous to reach. Moving the gigantic flock of dragons as well as his people will be no easy feat, especially since Grimmel (an intolerant brute) has a secret weapon that could destroy all the dragons. Additionally, Grimmel has another tool at his disposal: a beautiful, wild female Fury to lure Toothless away from Hiccup, his friend. Having transformed from Viking runt in the first movie to a tactical leader, responsible for the lives of his people and the future of all dragons, Hiccup has to make some hard choices, even if it means letting go of his closest friend. Retuning voice cast members include Jay Baruchel as Hiccup, America Ferrera as Astrid, Gerard Butler as Stoick, Kit Harrington as Eret, Craig Ferguson as Gobber and Jonah Hill as Snotlout, with newcomers to the franchise Cate Blanchett as Valka, Hiccup’s long-lost mother and F. Murray Abraham as the ruthless dragon hunter Grimmel. 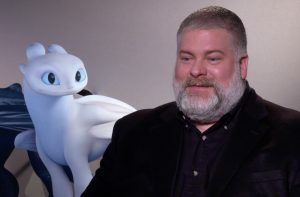 All three films have been written and directed by veteran animator Dean DeBlois, who cut his teeth on hand-drawn animation (co-directing 2002’s “Lilo & Stitch” with Chris Sanders who also co-directed the first “Dragon” movie with him) before embracing the world of computer-animation. DeBlois and his animators, with Oscar winning cinematographer Roger Deakins once again serving as visual consultant, have outdone themselves in this franchise finale with breathtaking imagery—especially in designing the colorful, exotic Hidden World under the ocean—and heartwarming storytelling with themes of growing up and finding the courage to face the unknown. He spoke by phone about making this “Dragon” film and telling this powerful story of love and friendship using incredible animation tools. Q: The look of this film is spectacular and the story is heartwarming, and even a little sad. DeBlois: Thank you. People have been reacting well to it; I’m always glad to hear that people shed tears. That was kind of the goal. It’s the constant evolution of technology since we started in 2008 on these movies. Every year, we’re able to do something better and more of it. Previous restrictions in terms of numbers of characters onscreen and complexities of environments or even amorphous shapes like water or clouds, we can create those with such convincing naturalism that makes the world come alive in a very palpable way. Q: The gleam of the armor and the details like the stubble on Hiccup’s face—it seems so real. It doesn’t seem like animation but live-action. DeBlois: That’s what we hope for. We hope to straddle the lines between the two mediums. Certainly, with the help of Roger Deakins and his live-action sensibility brought into our world, that helps. Plus, the fidelity of the imagery and the fine-detail we can get onscreen and the credibility with which it moves. It used to be difficult to make hair look right; you could always tell you were looking at a computer-animated character. But there are moments with Hiccup and Astrid, where they’re having a conversation and I find my eyes wandering around at the trees rustling in the background and the breeze that would blow Astrid’s hair around. It’s very overwhelming because I come from a hand-drawn animation background, so to see it go from impressive, as it was, back in 2008 to so thoroughly credible now, it makes me wonder where it’s going to go in 10 years. Will this movie look archaic and dated? I don’t know. Q: How did you connect with Roger Deakins to be your visual consultant on these films? He comes from the live-action filmmaking world. DeBlois: Back in 2008, when I joined the project with (co-director) Chris Sanders we, in hand-drawn animation, would have step called “The Workbook,” where we would combine the background with the character in a single frame to indicate what the light and shadow would be for pagers who would paint the background. We understood what the composition would be—the light, the shadow, all the important choices before we’d animate the shot. In the computer-animation equivalent, there is no stage that brings those two departments together. We have a department called “layout,” which chooses the composition, camera movement and lens choices, but it’s separated by months, sometimes a year or more in the production process, from the lighting department, which establishes light and shadow. It seemed very strange to us that those conversations would be separated, when they are by any cinematographer’s esteem, inseparable. So, we reached out to Roger Deakins, who’s our favorite cinematographer, to come in a do a couple of workshops. He proposed the idea of joining the production from start to finish. That was such a gift and an amazing collaboration in that he brought something to every step of the process—from the atmospheric mood boards that we put together at the beginning of the movie to the photos, a collage of images that would indicate either atmosphere or a color palate or some sort of compositional element, all the way through to shot compositions, the makeup of shots and storyboards. He would stay with the imagery all the way through to the end when we were lighting it, and he would advise on color palate and position of lights. So, it was like a master class for all of us. Every time he’d come in, in his mild-mannered way, he’d advise, challenge and question some of the choices we were making that may not have furthered the storytelling but maybe showing off too much. Q: You proposed a trilogy once you had the greenlight for a sequel. Did you know where you wanted this story to go in the final third installment back then and explain why the dragon went away? DeBlois: Yeah, from the moment there was discussion of a sequel, one that would see Hiccup complete his arc of going from this Viking runt that couldn’t do anything right to a wise, seasoned Viking chief by the end who’s known to be selfless, so that arc was intentional from the start, and it would accompany the disappearance of dragons. That was also another goal that had lined up with a conversation I had with Cressida Cowell (the author), who was working on the twelfth book in the series. She’d endeavored to explain what happened to dragons and why they are no more, and I thought that was gripping, mysterious and emotional idea. Even though the narratives are very different between the books and the films, I saw that as an end-goal that was really great—to return the world to the one we really know. Dragons fade away into myth and that period has more value because of it. Q: This film is for kids but there are themes that adults can relate to. DeBlois: Maybe I have a juvenile sensibility but I see animation as a medium to tell any story. Being that this is a family film by design, I lean into those elements that I would want to see onscreen, and the emotion and story I want to see as a moviegoer. I never spend time second-guessing a young audience. I just want to make sure there are enough elements that are whimsical and entertaining within the story where a young audience will feel engaged, as well, even if some of the mature themes are going over their head or otherwise not interesting to them. Q: You bring back Stoick the Vast in this. Was that planned from the outset? DeBlois: I did want to lean into flashbacks with the third installment to continue with Hiccup’s education by having him go back to memories of his father, which I feel is similar to my experience, having lost my father at 19 as well. Those little bits and pieces of memories, which seemed insignificant at the time, contained little lessons that you integrate into your life. Those bits of wisdom from the past help inform the decisions you’re making in the present, and help shape who you become in the future. So, that was intentional, and I was happy to tell Gerard Butler (who voices Stoick) that even though his character was going to die in the second film that he would continue to be a warm and important presence in the third film. In fact, we had many more flashbacks; we had six total, in the earlier versions of the movie, beyond the script. We actually storyboarded them. But you have to manage time in animation, because every minute is over $1 million. You have to pick and choose those most valuable moments so we used two of the six. I’ll make sure to use the other (four) on our eventual home-video release. Q: F. Murray Abraham provides the voice of the villain Grimmel in this one. Can you talk about casting him and what he brings to the character? DeBlois: He represents this immovable force of intolerance. We all know people in our lives who are unwilling to change that have staunch beliefs that are rooted in tradition and stubbornness. So, he’s a character that is meant to be charming in his own right and talks about doing things for the betterment of mankind but, in the end, it’s a shallow disguise for intolerance and a blanket disregard for an entire species. He has an elitist side to him and lack of empathy. He really was designed to represent the polar opposite of Hiccup’s inclusive desire to create a world where everyone can co-exist. (Grimmel) doesn’t like that idea; it’s unsettling to him. Even though he’s built this reputation on eliminating at least one dragon species, he is more interested and determined crush this larger, insidious idea of humans living with dragons. To him, they are vermin. They are murderers. They don’t belong in his world and he should have to share it with them. Q: The scene where Toothless and Light Fury are courting is almost wordless, accompanied by music. DeBlois: I wanted that scene to be a complementary to the forbidden friendship (of Toothless and Hiccup) in the first movie, which also was given room to develop and breathe, and also set to a beautiful piece of music by John Powell, and largely wordless, like that scene. Even down to the beach setting and isolation and the two characters getting to know one another in this strange touch and go manner, it’s almost like a dance on the beach that leads to communion. They had that in common. But we added to this one kind of a Cyrano de Bergerac element, with Hiccup whispering bad advice from the bushes, and Toothless being clumsy and inarticulate and unschooled in the ways of dragons, whereas Light Fury is of the Hidden World. She has not been corrupted by time spent with humans. It makes for a nice dilemma for him to face. We wanted to give it the room to live and breathe. We knew from the start this would be a standout moment if we did it correctly because it relies on the power of pantomime in the hands of our very talented animators, and the whimsy and transcendent quality of the score. Previous PostPhotos: ‘Star is Born,’ ‘Overlord,’ More on Home Entertainment … Plus a Giveaway!! !